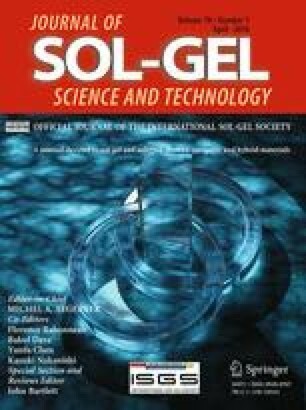 This study proposes a method for preparing high-concentration silica-coated Au (Au/SiO2) nanoparticles in colloidal solution from 1.5 × 10−3 M hydrogen tetrachloroaurate (III) trihydrate as the Au source and 1.0 × 10−2 M sodium citrate as the reducing reagent. The colloidal solution is applied to X-ray computed tomography (CT) imaging of mouse tissue. The Au nanoparticles in the colloidal solution had a diameter of 18.9 nm, and the Au concentration reached 1.5 × 10−3 M. The Au nanoparticles were silica-coated by modifying their surfaces with (3-aminopropyl)trimethoxysilane (APMS), then depositing silica nuclei generated by a sol–gel reaction of tetraethyl orthosilicate (TEOS) in water/ethanol initiated with sodium hydroxide (NaOH) on the surface modified with APMS. A colloidal solution of Au/SiO2 core–shell particles (silica shell thickness = 19.7 nm) was formed in a final as-prepared solution of 2.7 × 10−4 M Au, 2.0 × 10−5 M APMS, 24 M H2O, 1.9 × 10−3 M NaOH, and 4.1 × 10−3 M TEOS. The Au in the as-prepared colloidal solution was further concentrated to 0.27 M by salting-out and centrifugation. The CT value of the concentrated Au/SiO2 colloidal solution was 2.52 × 103 Hounsfield units, double that of a commercial X-ray contrast agent with the same I concentration as the Au concentration. When injected into mouse tissue, the Au/SiO2 colloidal solution demonstrated good imaging capability. We express our thanks to Prof. T. Noguchi at the College of Science of Ibaraki University, Japan (current affiliation: Faculty of Arts and Science of Kyushu University, Japan), for his help with the TEM observation. This study was supported by a Grant-in-Aid for Scientific Research on Innovative Areas “Nanomedicine Molecular Science” (No. 2306) from the Ministry of Education, Culture, Sports, Science, and Technology of Japan, by JSPS KAKENHI Grant Number 24310085, and by A3 Foresight Program from JSPS.